Long known as the European Elm Flea weevil (Orchestes alni), this non-native was thought to be wreaking havoc on elms in the U.S. since the early 2000s. However, recent research revealed this species does not occur in the U.S. 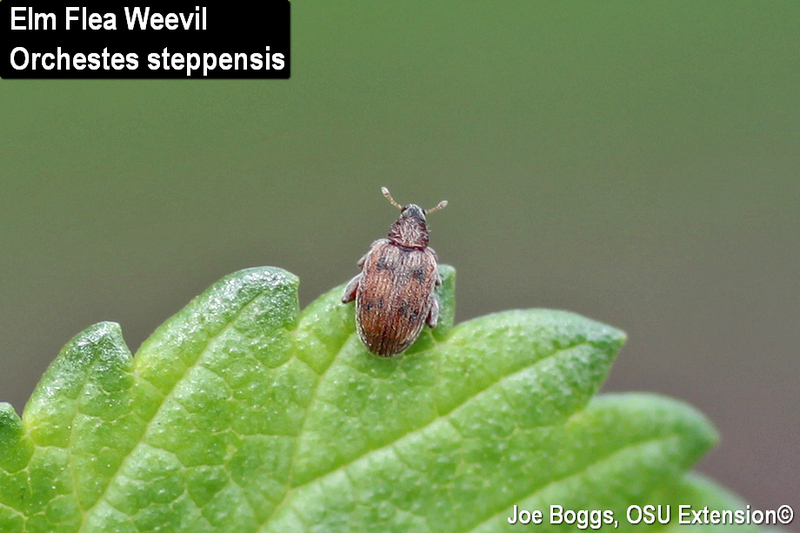 The true culprit is another non-native weevil, O. steppensis. The mistaken identity began with a 2003 report published in an entomological journal noting that a new non-native weevil had been discovered in the central U.S. The authors identified the weevil as O. alni. This species was known to occur in Europe, so the weevil was eventually given the approved common name of European Elm Flea Weevil. Since that time, the weevil has been found throughout the Midwest including Ohio as well as several eastern states and a few western states. However, entomologists in the U.S. began to recognize that a number of characteristics they were observing did not match with descriptions published about O. alni in Europe. Dave Shetlar and his M.S. graduate student James Radl began looking into this conundrum a couple of years ago and ultimately found the true culprit to be O. steppensis which is native to Russia and the Far East, primarily living in the steppe lands of Asia. As far as anyone knows, O. alni does not occur in North America. "Orchestes alni" for literature reviews and web searches yields mixed results; literally. Valid research and observations for O. steppensis that have been generated in the U.S. are mixed with information on O. alni produced in Europe. The results could lead both researchers and practitioners astray regarding the life history, host ranges, biological controls, etc. for both species. On the bright side, all of the observations and research reports published thus far in the U.S. remain valid even if the information applies to O. steppensis and not the European elm flea weevil, O. alni. However, it's important to start keeping things straight now that we know what's what. Currently, there is a move afoot with the Entomology Society of America (ESA) to address the names issue; perhaps by assigning O. steppensis a unique common name (Shetlar Flea Weevil?). In the meantime, I'm going to use "Elm Flea Weevil" for O. steppensis even though this common name has not been approved by the ESA. Overwintered Elm Flea Weevils are currently attacking emerging elm leaves in southwest Ohio. A close examination will reveal weevils feeding and frolicking (mating) among the newly expanding leaves. An even closer look will reveal why these beetles are called "flea weevils." Weevils are beetles with snouts; look closely with a hand lens and you'll see these weevils have a prominent snout (rostrum). If you're careful, you will also see that their hind femurs are thickened to hold powerful muscles allowing them to jump like a flea. This means if you're not careful, the flea weevils can quickly flee. Adults use mouthparts at the end of their snouts to create small holes in the newly emerging leaves. These holes will expand as the leaves expand. Adults continue to feed on fully expanded leaves producing small skeletonized holes. The early and late spring adult feeding activity produces a characteristic "shothole" effect on elm leaves which is the most obvious symptom produced by the elm flea weevil in the U.S. Females lay eggs into mid-veins and major lateral veins of the leaves. Damage caused by oviposition becomes more noticeable with leaves failing to fully expand beyond the vein wounding and the affected area turning yellow and curling downwards. Once the eggs hatch, larvae begin feeding as leafminers tunneling through the leaf tissue toward the margins of the leaves. Apparently, the oviposition and larval leafmining damage is much more pronounced with O. alni in Europe compared to O. steppensis in the U.S. In fact, this damage is almost inconsequential aesthetically compared to the adult feeding damage produced by O. steppensis. The elm flea weevil attacks all species of elms including American elm (Ulmus americana) selections. However, Dave and James found there are some significant differences with adult feeding activity among the Oriental elms as well as hybrid elms. They observed little differences with egg laying preferences among the hybrid elms. Although the leaf damage produced by the adults is very noticeable, it has not been observed to be severe enough to cause harm to the overall health of landscape trees. Thus, insecticide applications are not warranted. In fact, topical insecticide applications could make things worse by killing bio-allies. According to various reports in the U.S., parasitic wasps may be capable of keeping populations well below acceptable levels. Of course, trees grown in nurseries are different matter particularly if they are scheduled for sale this fall. Topical insecticides labeled for use in nurseries such as various pyrethroids (e.g. bifenthrin, permethrin, etc.) are effective in reducing see-through leaves and leafmining damage if they are applied now in southern Ohio; any delay can result in unacceptable damage. However, there may still be time to avoid damage to nursery trees in the northern part of the state. Neonicotinoid systemic insecticides such as imidacloprid or dinotefuran are also effective, but needed to be applied before now to avoid leaf damage in southern Ohio. The clock is ticking for the northern part of the state. This is particularly true of imidacloprid which requires a number of weeks to reach toxic levels in the leaves. If the systemic insecticides are applied now, they can reduce but not eliminate leafmining and adult feeding damage. But, there may still be time in northern Ohio for dinotefuran to have an appreciable impact.